David again brought together out of Israel chosen men, thirty thousand in all. He and all his men set out from Baalah of Judah to bring up from there the ark of God, which is called by the Name, the name of the Lord Almighty, who is enthroned between the cherubim that are on the ark. They set the ark of God on a new cart and brought it from the house of Abinadab, which was on the hill. Uzzah and Ahio, sons of Abinadab, were guiding the new cart and they brought it with the ark of God from the house of Abinadab, which was on the hill, and Ahio was walking in front of it. David and the whole house of Israel were celebrating before the Lord with all kinds of instruments made of pine, and with harps, lyres, tambourines, sistrums, and cymbals. When Jesus came down from the mountainside, large crowds followed him. A man with leprosy came and knelt before him and said, "Lord, if you are willing, you can make me clean." Jesus reached out his hand and touched the man. "I am willing," he said. "Be clean!" Immediately he was cleansed of his leprosy. Then Jesus said to him, "See that you don't tell anyone. But go, show yourself to the priest and offer the gift Moses commanded, as a testimony to them." The ark represented the Lord; so it embodied everything sacred and heavenly. When Uzzah reached out to the ark, it represented our own power, which is our ego. And since our ego is unholy, the word "hand" is left out--though it is understood. It is left out so that the angels would not sense that something so profane had touched what is holy. Uzzah the son of Abinadab died because he seized the ark with his hand, since "touching with our hand" means communicating. We communicate with the Lord through the goodness of love. Yet Uzzah was not anointed as the priests and Levites were--and when they were anointed, this caused them to represent the goodness of love. Also, the cherubim on the mercy seat that was on the ark symbolized a safeguard to make sure that the Lord would not be approached except through the goodness of love. The story of "the sin of Uzzah," as our reading from 2 Samuel traditionally known, is a favorite one for skeptics to bring out as evidence that the God of the Bible is not worthy of our belief. Such a simple and natural act--steadying the ark to keep it from falling--and poor Uzzah is struck dead by God! Who could believe in such a petty, oversensitive God? Even king David found this hard to take. He responded to God's destructive anger against Uzzah with anger of his own. Naturally, he was also very much afraid. As the story continues, instead of bringing the ark up to Jerusalem as he had planned, he took it aside to the home of a man named Obed-Edom. It wasn't until David saw that the Lord blessed the household of Obed-Edom because the ark was there that he finally did bring the ark up to Jerusalem, three months after his original attempt. Now, let me be right out front and say that I don't believe God strikes people dead. Ever. Yes, I know that the Bible says he does. But this is what our church's teachings call an "appearance of truth." When we humans are in a state of mind that is very far away from the love and truth of God, then God's love looks like wrath and anger to us, and God's truth looks like a destructive, deadly force. And since the Bible must reach out to us even in our lowest and most distant states of mind, it often speaks in terms that we'll understand and appreciate--but that aren't the way things really are from God's point of view. With these thoughts in mind, we can return to the story of Uzzah reaching out and touching the ark, and dying as a result. To us today, this seems like a punishment all out of proportion to Uzzah's actions. But in the context of his own culture, it makes more sense. Some background will help. Uzzah and his brother Ahio, who were guiding the cart on which the ark was being carried, were sons of Abinadab, in whose house the ark had been for a long time--at least twenty years, according to the figure given in a passage in 1 Samuel (7:2). Having spent that much time with the ark in their house, Uzzah and his brother must have known that there were very strict rules about how the ark was to be handled. One of those rules was that no one was ever to touch the ark. Even when the ark was carried, it was always carried by the poles on either side of it, without touching the ark itself. Uzzah would also have known from the recent history of the ark, just before it came to its house, that death and destruction came very quickly to those who did not treat it with proper respect and reverence. (See 1 Samuel chapters 5 and 6.) 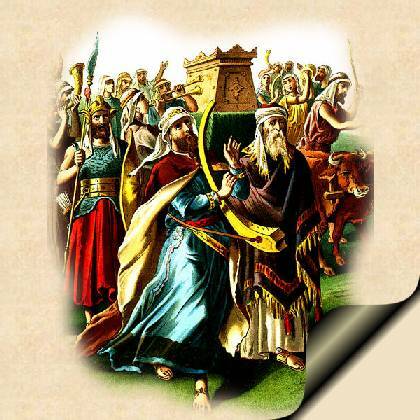 And further, the proper mode of carrying the ark was not on a cart; the priests were supposed to carry it on their shoulders--holding it by its rods, of course. If the ark had been carried properly, this whole episode could not have happened, because there would have been no cart holding the ark, and no oxen pulling that cart who could have stumbled. Seen in this light, and in this context, the "sin of Uzzah"--and its severe punishment--begins to make a little more sense. Uzzah knew the rules, but he broke them anyway. From our perspective, it looks like he was trying to protect the ark. But from the perspective of an Israelite of that time, reaching out and touching the ark was a sign of supreme disrespect for it--and for the Ten Commandments, which were in the ark, and the God who gave those Commandments. It was a sign that Uzzah was more confident in himself and his own power than he was in the power of the ark of God to take care of itself. Once again, I don't believe that God literally struck Uzzah dead; that is only how it appears to us. However, the people of those ancient times were steeped in superstition, and they believed strongly in the life-and-death power of the supernatural. For them, a serious breach of sacred protocol such as Uzzah committed when he reached out and touched the ark would be quite sufficient to bring powerful spiritual and psychological forces to bear--forces that could very easily cause Uzzah's instant death. We know that people who believe strongly enough that they are going to die can cause their bodies to shut down even when there are no natural causes sufficient to kill them. Uzzah's own consciousness of his terrible sin--according to the beliefs he had been steeped in all his life--was likely what killed him. And so the saying of Jeremiah came true for him: "Your own wickedness will punish you." What can this story possibly mean for us today? After all, most of us don't believe that God will strike us dead if we improperly handle something sacred to us, such as the Bible. In our culture, cases of divine vengeance smiting sinners to death on the spot are quite rare! We can begin to get at the deeper meanings in this story if we consider the state of mind Uzzah was in when he reached out and grasped the ark in order to steady it. He thought that he, Uzzah, could guide and direct the ark of God. He thought that his own hand was more powerful than God's to keep the most sacred physical embodiment of God's presence among his people on its course. At the moment when Uzzah reached out and steadied the ark, he thought that he was more powerful--more in control of the situation--than God. Do we ever think this way? It isn't all that hard to come to the conclusion that God really isn't in control of the situation here on earth. One look around us at all the war, poverty, disease, and injustice in the world is enough to convince us that something is seriously out of whack around here. Why doesn't God get things under control? Why doesn't God right the wrongs, and bring justice to all the earth, as the Bible promises? Perhaps it is because God really isn't in control--or just doesn't care enough about us to bother. At any rate, it certainly does seem that if we don't get busy and fix things up around here, God isn't going to do it for us. So who's in charge here, anyway? Doesn't everything depend upon us? Why shouldn't we reach out and grab hold of the course of this world's social evolution before things go to complete ruin? It's a lot better than waiting for a God who doesn't seem at all ready and willing to take charge and fix up our world. Isn't this just the same kind of thinking that was running through Uzzah's hand as he saw the oxen stumbling, and reached out his hand to steady the ark? It was all up to him, wasn't it, to make sure that no harm came to the ark? And it's all up to us, isn't it, to make sure that no harm comes to this world of ours--to its people and its natural environment. Yet our attempts at building the perfect society have been dismal failures. Throughout the ages, humans have attempted to build empires in their own images--and the result has been war, slaughter, oppression, and slavery. Even those who sought to be "benevolent dictators" ended out presiding over despotism and disorder. In the twentieth century, we thought we could do it better. We set up totalitarian states falsely named "socialism," "communism," and even "capitalism," and tried to force our populations to become a society of perfectly socially adjusted, altruistic people who lived one for all, and all for the one. None of these social and governmental experiments has worked. They have all been based on the idea that if the right enlightened group of human beings (us!) could just get into power, we could fix up this world of ours through the sheer force of our own enlightened theories and ideas. We believed--and apparently still continue to believe--that we are better than God at running this world. And we are wrong. Our so-called "enlightened theories" have only made things worse. We have reached out our hand to steady the ark, and millions of people have died. Sooner or later, we will realize that we can never get our world on the right track through the so-called power of human ingenuity. We have tried over and over again to get things right, and it hasn't worked. We are still trying--and will probably keep trying for many more years before we finally admit that human intelligence is simply inadequate to the job of guiding our world. Our minds are limited, finite, and faulty. The job is too big for us. Only the mind of God can guide such an incredibly complex organism as our earth--with all the amazing complexities in the world of nature, and all the staggering diversity of its human cultures and peoples. And only when we turn to God for guidance will we even begin to gain the insight that we need to act wisely and constructively even in our little corner of the world, let alone being able to run a nation or the world as a whole. Let's return to the ark for a moment. Why was it so sacred? The ark itself was nothing particularly spectacular. It was a wooden box overlaid with gold, and with golden cherubim (winged human figures) on its cover. Yes, it might have been impressive to an ancient Israelite with all that gold--but nothing for people to be struck dead over. It was not the ark itself, but its contents that made it sacred. Within the ark of God were the Ten Commandments--the most sacred core of the ancient Jewish law, spoken in God's own voice from Mt. Sinai, and written in God's own finger on the stone tablets that were the only contents of the ark. These Ten Commandments summarized and symbolized the entire law of God. An awe and reverence of the Ten Commandments, and the ark that contained them, was an expression of awe and reverence for the entire Word of God--for all of God's divine commandments, teachings, and laws. These are the same laws that govern our universe and our world. They are the laws that govern all of human society, and every human community. They are the laws that govern our own individual lives every day, and every moment. In the end, these divine laws cannot be violated any more than the law of gravity can be violated. They are fixed and eternal--and all people who set their face against them will, in the end, bring certain destruction upon their own heads because they are flying in the face of the very nature of reality. If we think that we can run our world or even our own individual lives better than God can, then we, like Uzzah, are reaching out and steadying the ark of God. And like Uzzah, in our pride and arrogance we will bring our own destruction upon ourselves. But if we recognize in our heart, mind, and life that the Lord is truly in control--and that this is good--then we can once again bring the ark of God up to Jerusalem with singing and dancing, and place God's eternal laws at the center of our lives where they belong. Amen.